Mens Sweater sets are a stylish and great way to look good and stay warm at the same time. If you have been invited to any Holiday or Christmas party, you will be more than looking your best by wearing these sweater and pants sets. 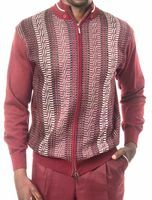 These sweater sets come with the matching pants and are great to wear with your Alligator Shoes or Stacy Adams Shoes and Kangol hats or dress it up a bit more with a matching color Homburg Hat. If you really bring the style game with you, try a Godfather hat or Fedora and show people what time it is. You will look more than your best when you show up at that Holiday party.